“Dripping water hollows out stone,” muses Klas Tjebbes. “Women’s football is making progress. But it’s happening much too slowly.” A wave of change, then, not dripping water, is what is needed to improve structures within women’s football. This unmistakable message manifests in Football for better or for worse, a Swedish documentary that brings to life the everyday obstacles that female athletes face on the road to fair opportunity. 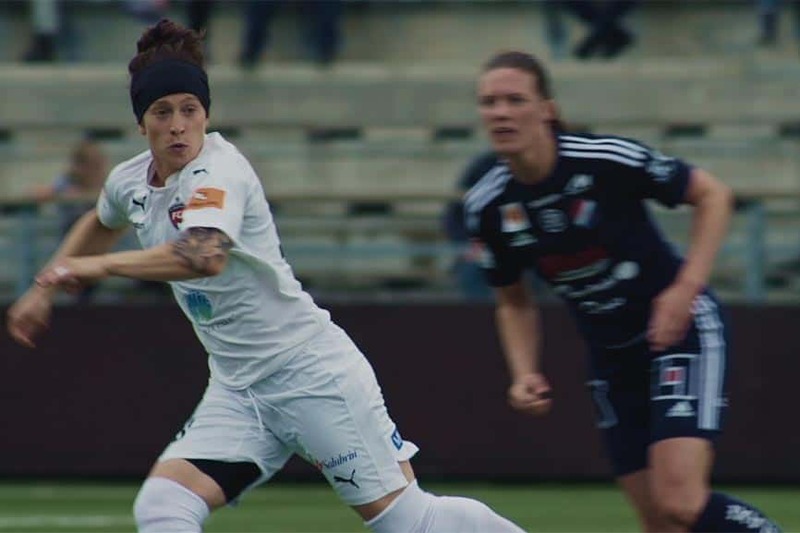 Inger Molin’s documentary Football for better or for worse follows Swedish club FC Rosengård over two years to delve into the world of women’s professional football with intelligent poise and a welcome sense of self-awareness. Embracing the position that football is a way of life, Molin’s 72-minute documentary constructs an absorbing, multi-layered narrative that traces the branches of sexism and unequal opportunity through all aspects of women’s football — from the precariousness of playing professionally to the troubles of securing public interest — while advocating for greater fairness for women’s football. The documentary, which was initially released in 2017, is set for its Canadian premiere on June 9 as part of the 10th annual Canadian Sport Film Festival. It’s Rosengård’s managing director Tjebbes that provides the stinging criticism of the inequalities between the men’s and women’s game as he wrestles with a fiscally conservative board in a bid to secure FC Rosengård’s financial future. The problem, however, extends to the financial structure of UEFA, the administrative body of European association football, which grossly disadvantages women’s football. Annually, it provides €1.25 billion to the men’s Champions League but only €2.1 million to the women’s Champions League — this is just 0.2 per cent of the finances provided to men. As the documentary progresses through the hurdles of women’s football, it embraces Rosengård players’ personal lives to pad the emotional baggage that comes with being the elite female athletes in an underappreciated and underpaid sport. This is perhaps where it shines most. An intimate, emotionally draining scene featuring Canadian goalkeeper Erin McLeod and her wife, American winger Ella Masar, discussing the difficult transition to life as Rosengård players immediately precedes Masar and the team engaging in playful, light-hearted banter on the road. Series of ups-and-downs, both professionally and personally, allow the filmmakers to make intelligent use of sound and a melancholic piano theme, constantly reminding the viewers of the slow, underlying process of progressing toward fairness. In Football for better or for worse, there is no happy ending, no conclusion to wrap everything up. Football, like life, goes on, and so does the fight for fairness. Molin’s documentary is not one tracking the on-field successes of FC Rosengård, it is one tracking the behind-the-scenes progress and the many, many setbacks on the journey to fairness. “Sometimes you wonder, is there any hope at all? But that’s to do with social structures,” Tjebbes says. “UEFA are a bunch of old men. Sometimes I’m very pessimistic. They’ll never get why, on a fundamental level, it’s important for girls and boys to have equal footballing opportunities. They’re so stuck on the idea that men are the norm — they’re not. That’s where gender comes in.” Football for better or for worse makes its Canadian premiere at the TIFF Lightbox on Saturday, June 9. Student tickets are $8.10.